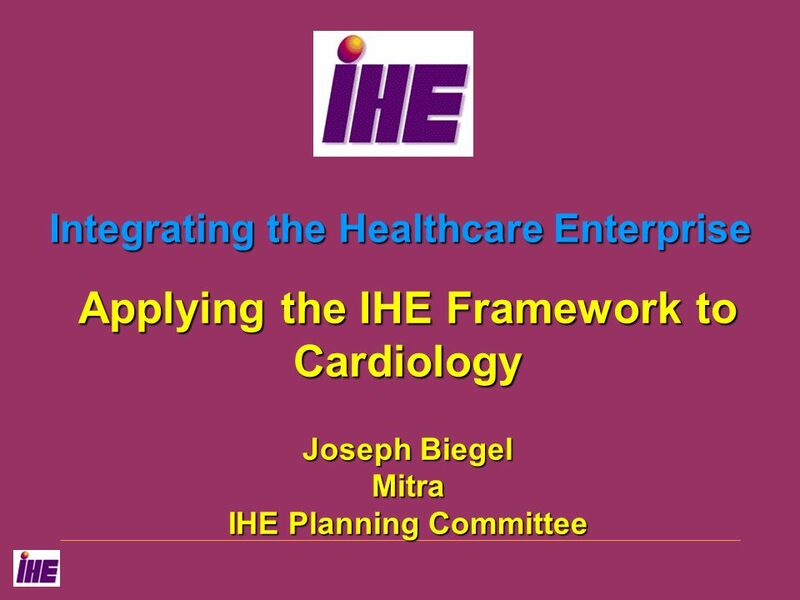 Integrating the Healthcare Enterprise Applying the IHE Framework to Cardiology Joseph Biegel Mitra IHE Planning Committee. 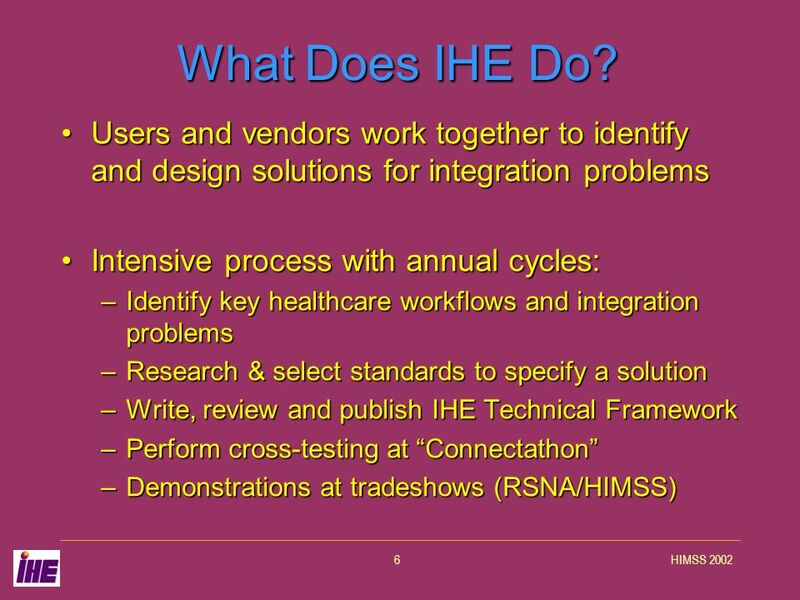 4 HIMSS 20024 Why is IHE needed? 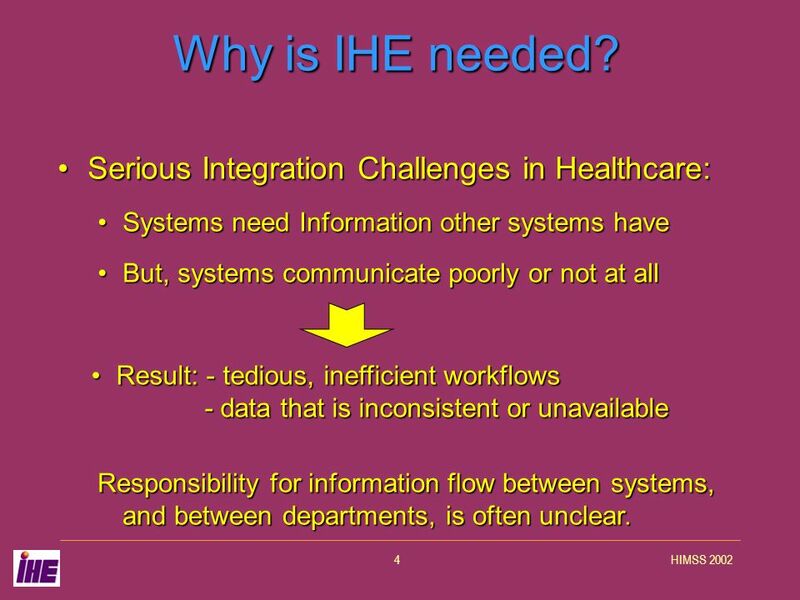 Serious Integration Challenges in Healthcare:Serious Integration Challenges in Healthcare: Systems need Information other systems haveSystems need Information other systems have But, systems communicate poorly or not at allBut, systems communicate poorly or not at all Result: - tedious, inefficient workflows - data that is inconsistent or unavailableResult: - tedious, inefficient workflows - data that is inconsistent or unavailable Responsibility for information flow between systems, and between departments, is often unclear. 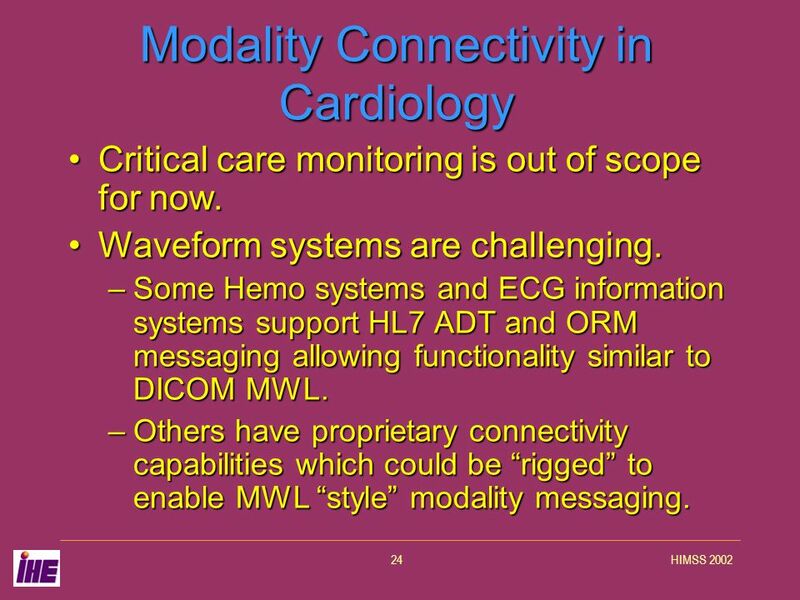 24 HIMSS 200224 Modality Connectivity in Cardiology Critical care monitoring is out of scope for now.Critical care monitoring is out of scope for now. 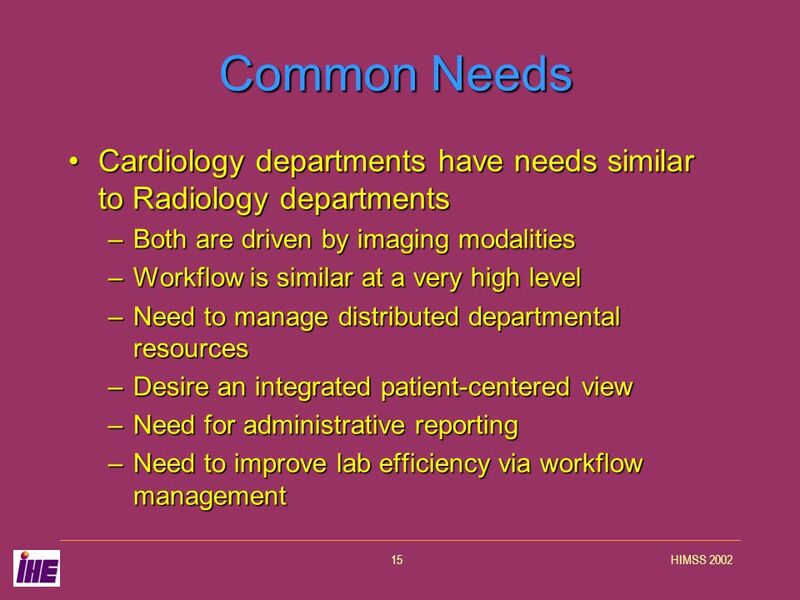 Waveform systems are challenging.Waveform systems are challenging. 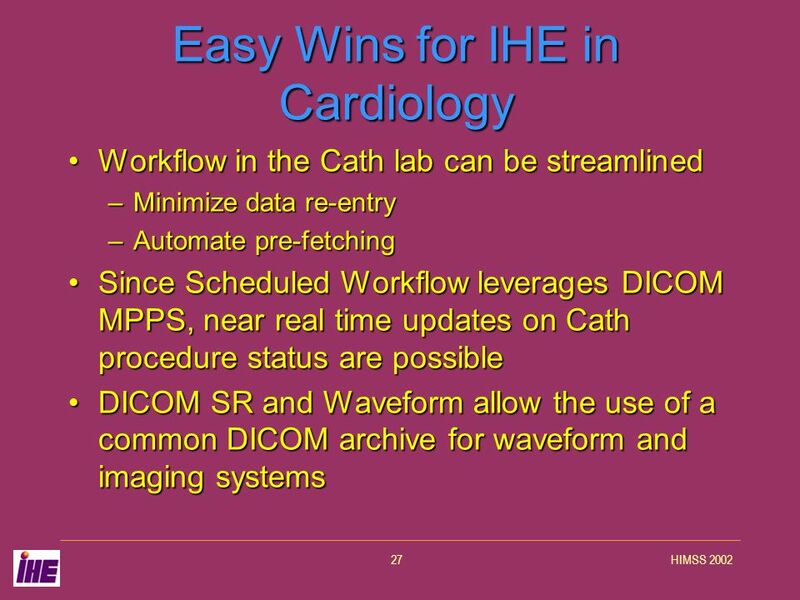 –Some Hemo systems and ECG information systems support HL7 ADT and ORM messaging allowing functionality similar to DICOM MWL. 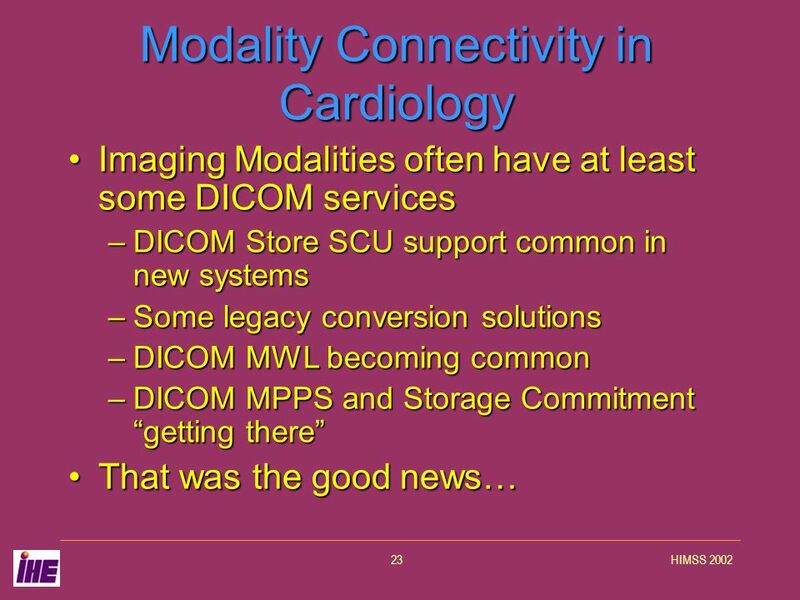 –Others have proprietary connectivity capabilities which could be rigged to enable MWL style modality messaging. 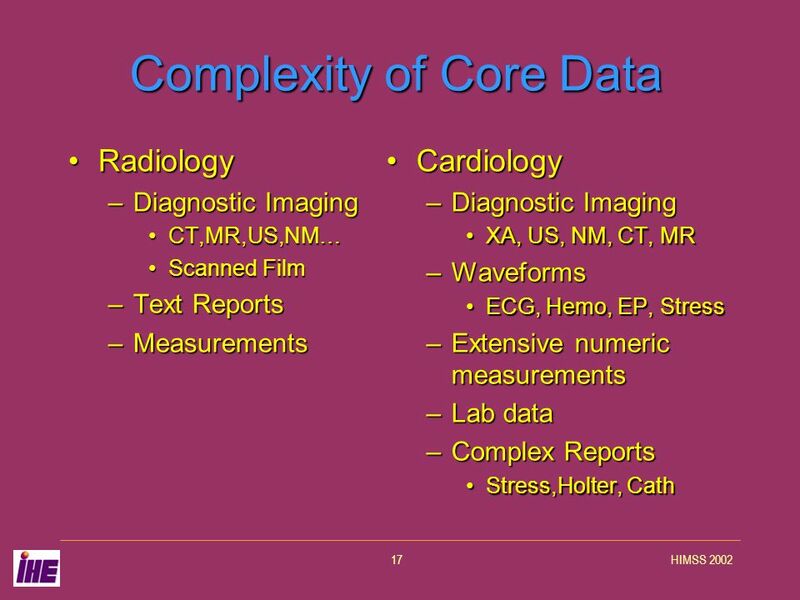 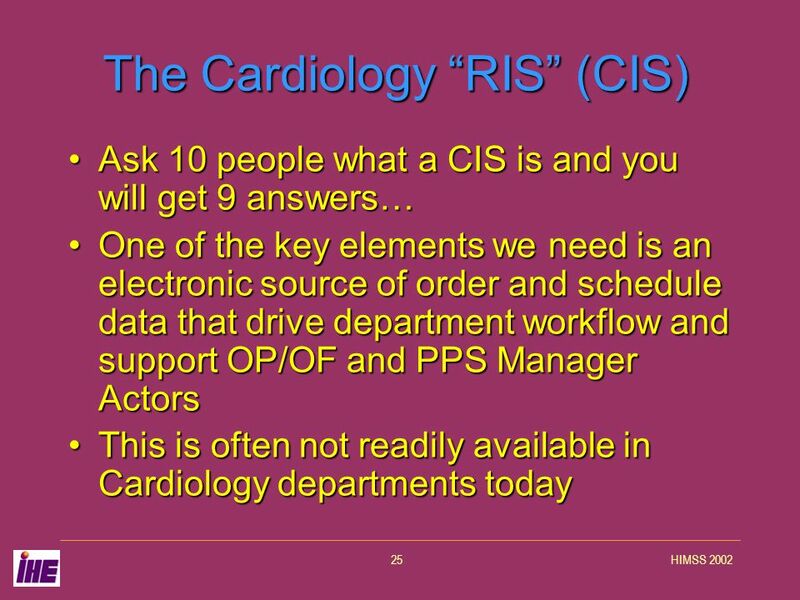 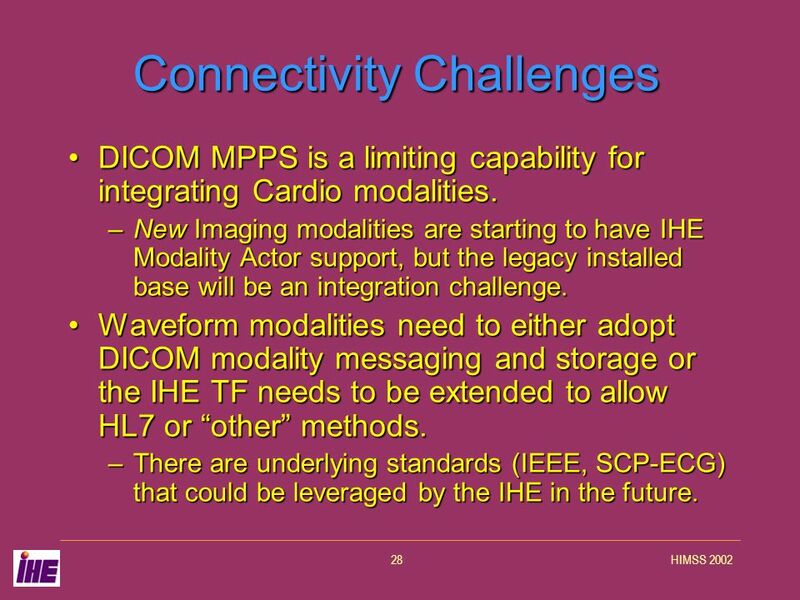 28 HIMSS 200228 Connectivity Challenges DICOM MPPS is a limiting capability for integrating Cardio modalities.DICOM MPPS is a limiting capability for integrating Cardio modalities. 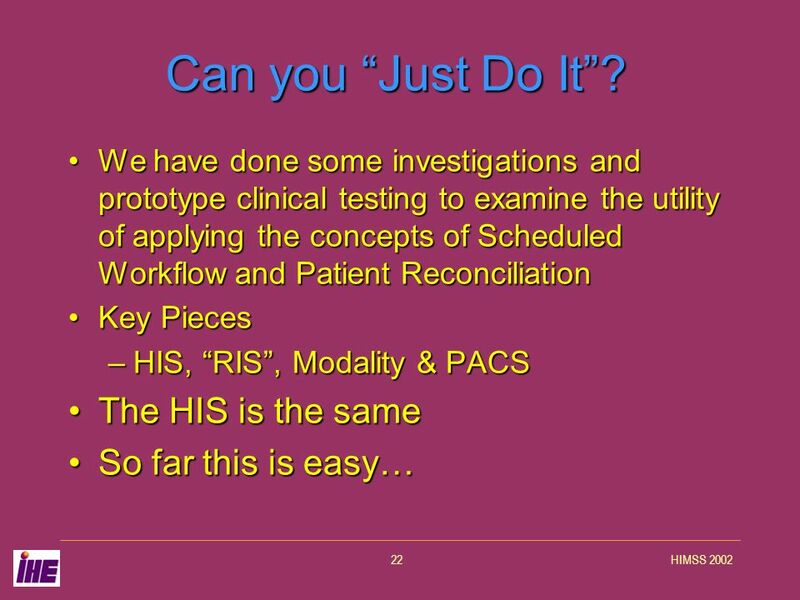 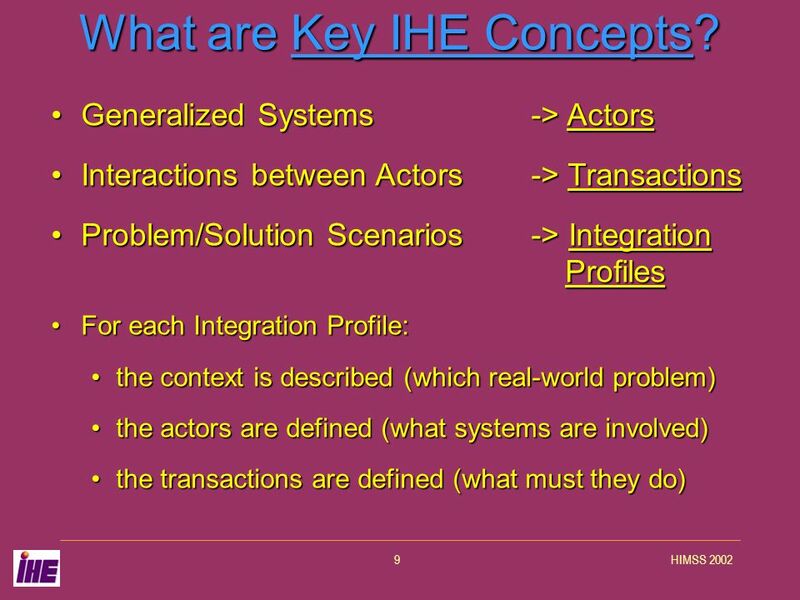 –New Imaging modalities are starting to have IHE Modality Actor support, but the legacy installed base will be an integration challenge. 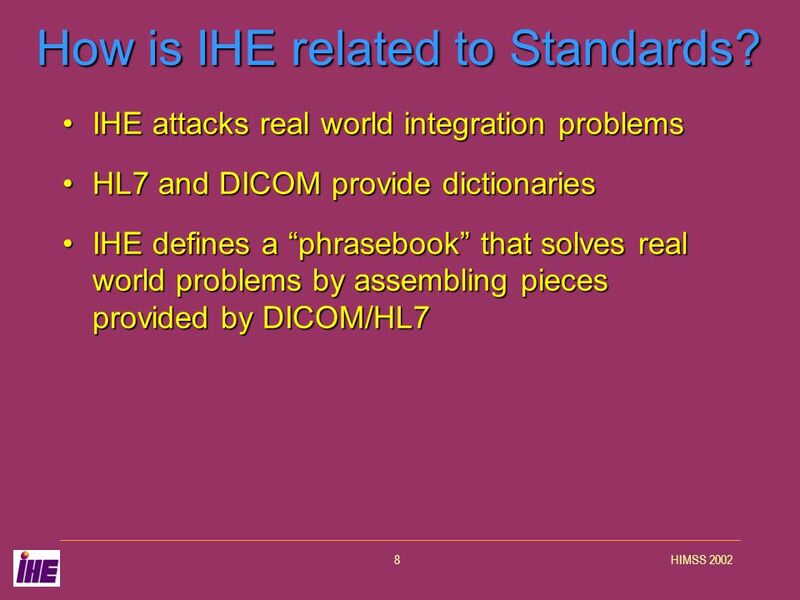 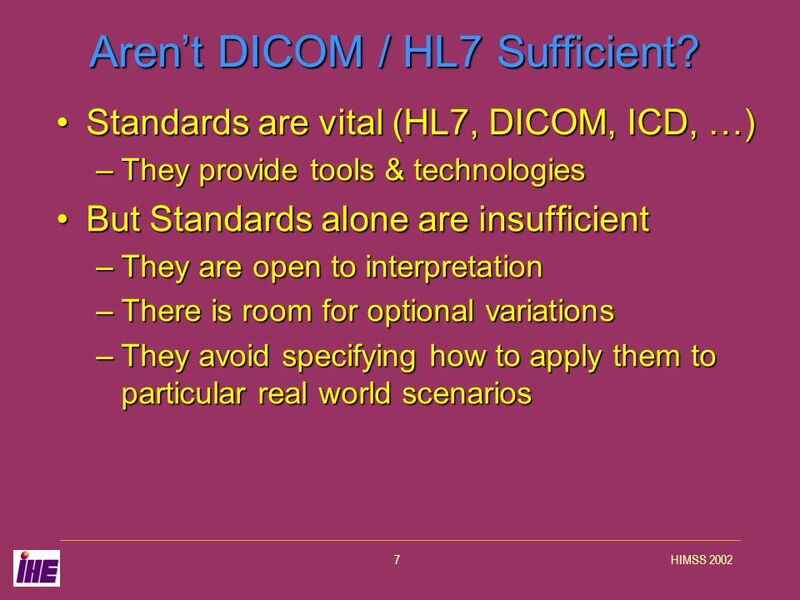 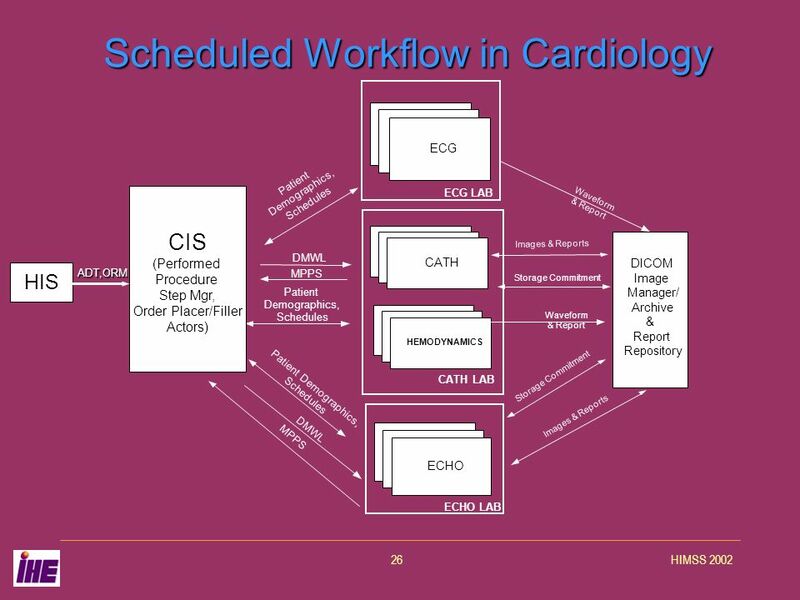 Waveform modalities need to either adopt DICOM modality messaging and storage or the IHE TF needs to be extended to allow HL7 or other methods.Waveform modalities need to either adopt DICOM modality messaging and storage or the IHE TF needs to be extended to allow HL7 or other methods. 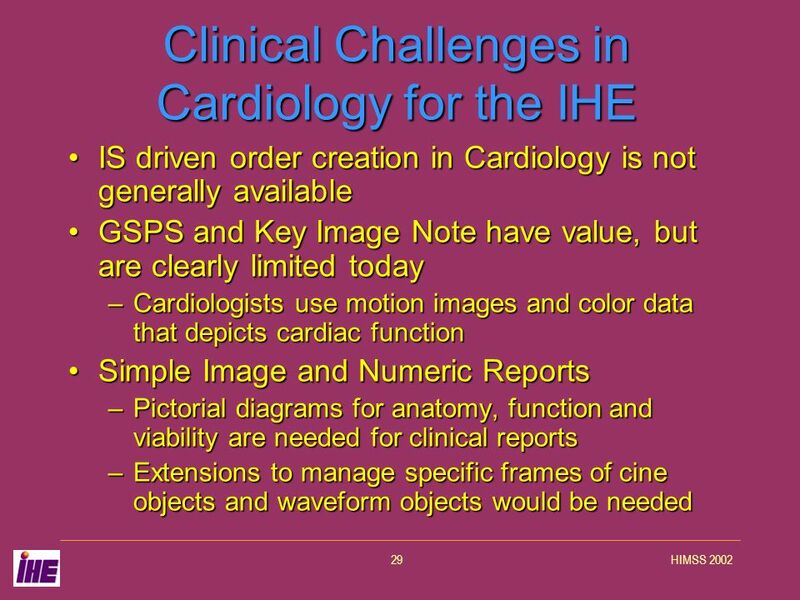 –There are underlying standards (IEEE, SCP-ECG) that could be leveraged by the IHE in the future. 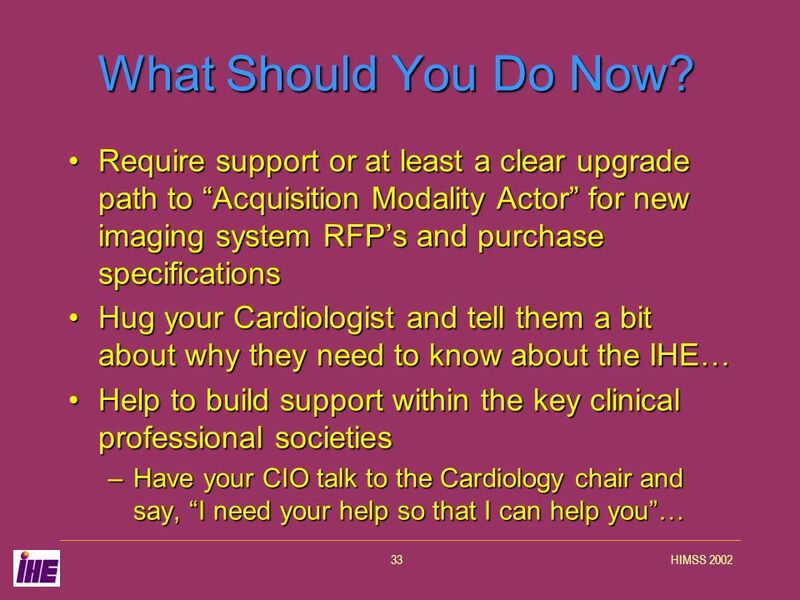 32 HIMSS 200232 Conclusions The value is clear.The value is clear. 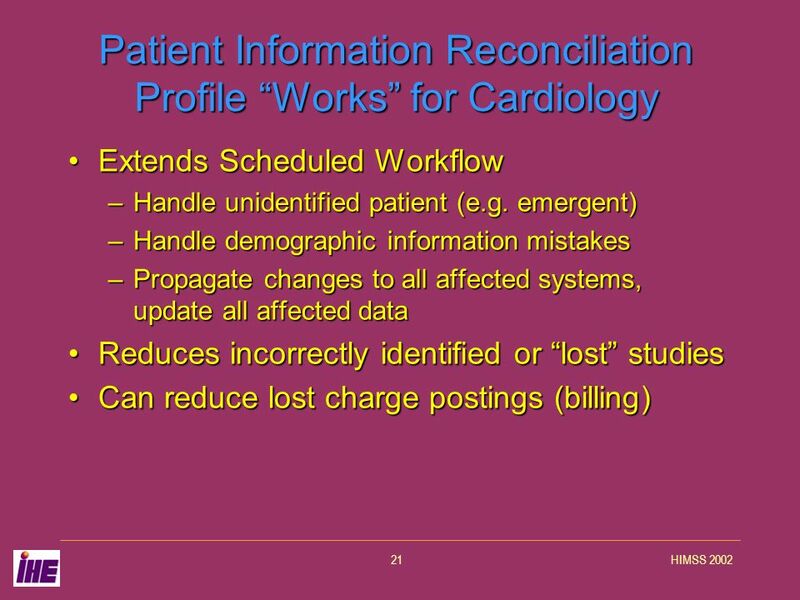 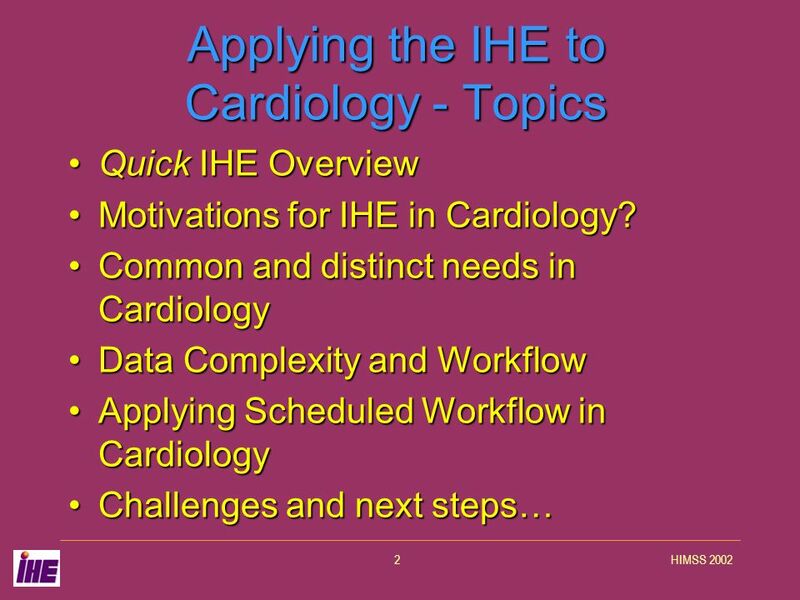 –Applying and extending the IHE to Cardiology could save millions of dollars in product development costs –It could improve the quality and efficiency of care IHE Scheduled Workflow and Patient Reconciliation Integration Profiles are nearly ready to go in Cardiology.IHE Scheduled Workflow and Patient Reconciliation Integration Profiles are nearly ready to go in Cardiology. 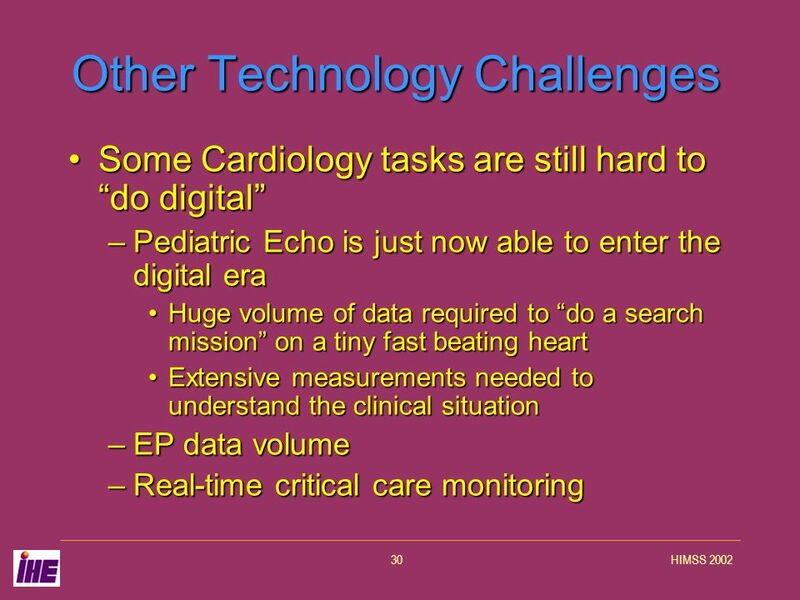 There are challenges.There are challenges. 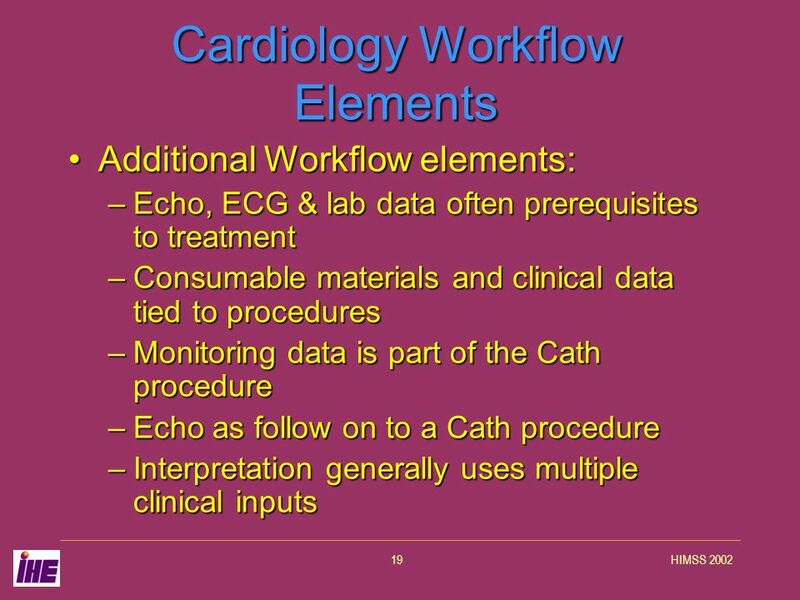 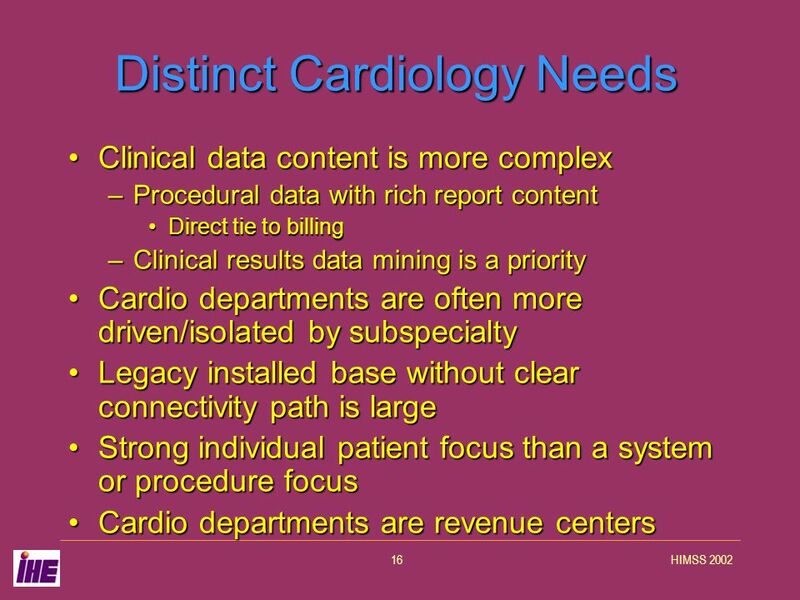 Need to extend the Technical Framework for some Cardiology specific needs.Need to extend the Technical Framework for some Cardiology specific needs. 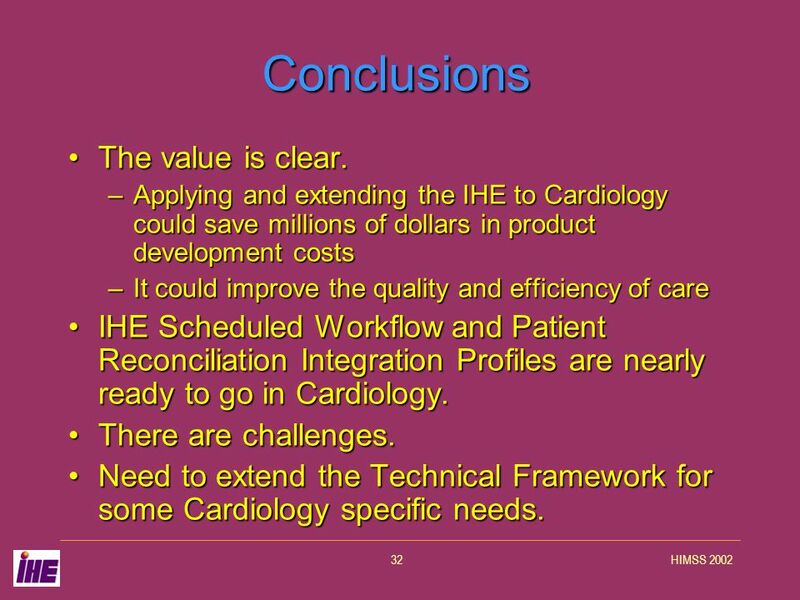 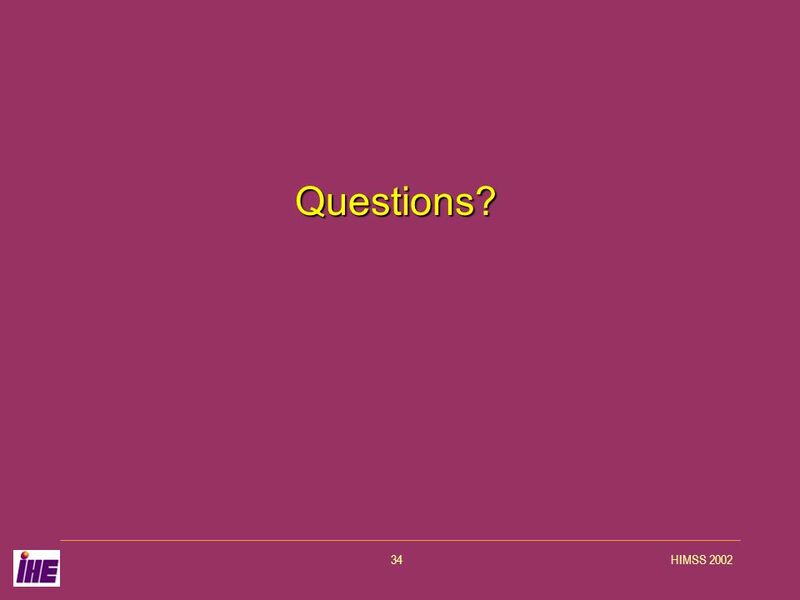 Download ppt "Integrating the Healthcare Enterprise Applying the IHE Framework to Cardiology Joseph Biegel Mitra IHE Planning Committee." 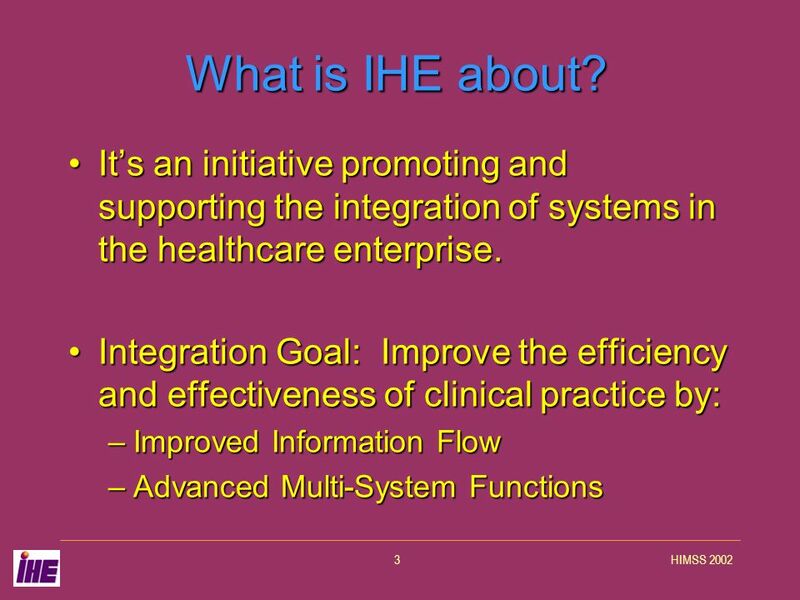 IHE Canada Workshop – Sept What IHE Delivers 1 Kevin ODonnell Toshiba Medical Systems IHE Structure & Concepts. 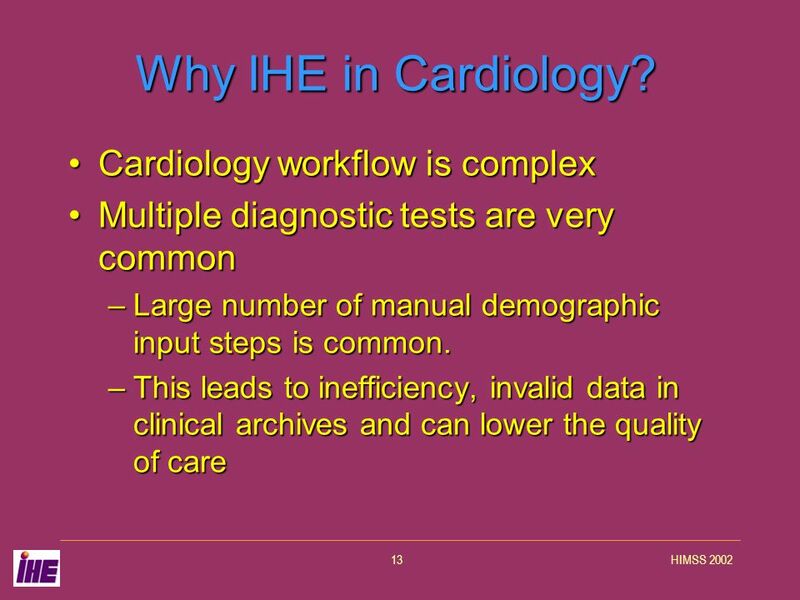 DICOM Structured Reporting Workshop - March 2000 Structured Reporting and the IHE Year 2 Technical Framework Simon Wail, PhD Marconi Medical Systems. 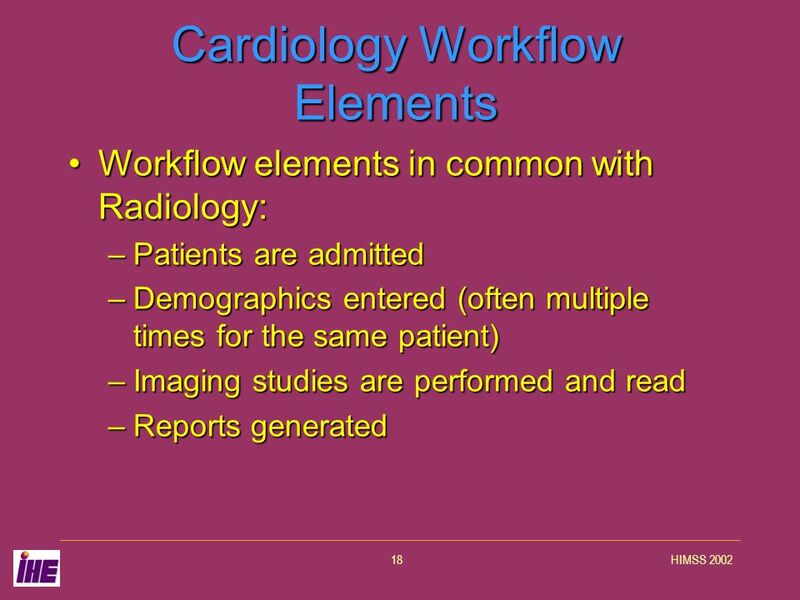 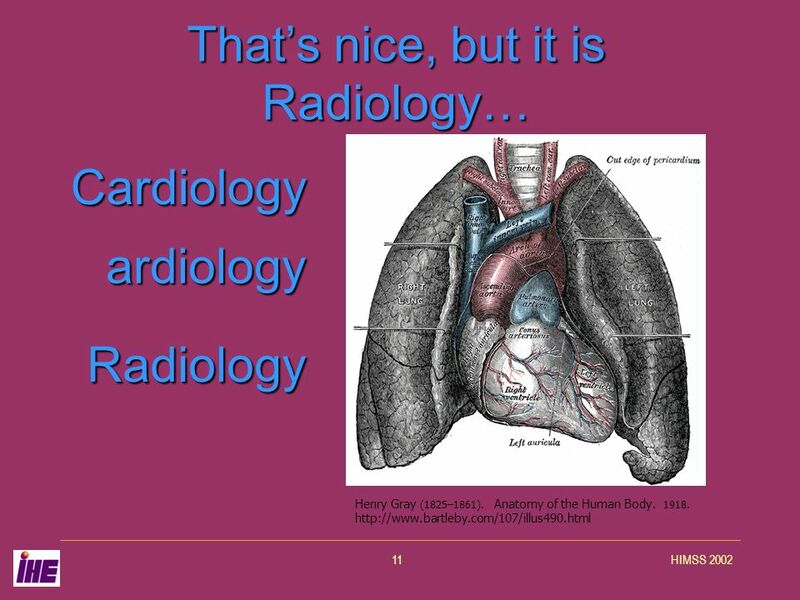 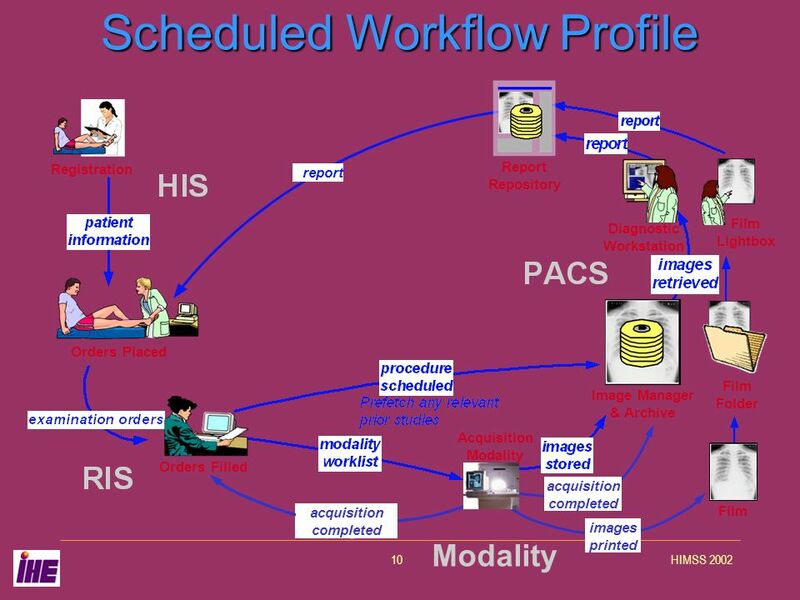 IHE Radiology Integration Profiles: ▪ Post-Processing Workflow ▪ Reporting Workflow IHE Educational Workshop – June 11-13, 2007 Nikolaus Wirsz, PhD Manager. 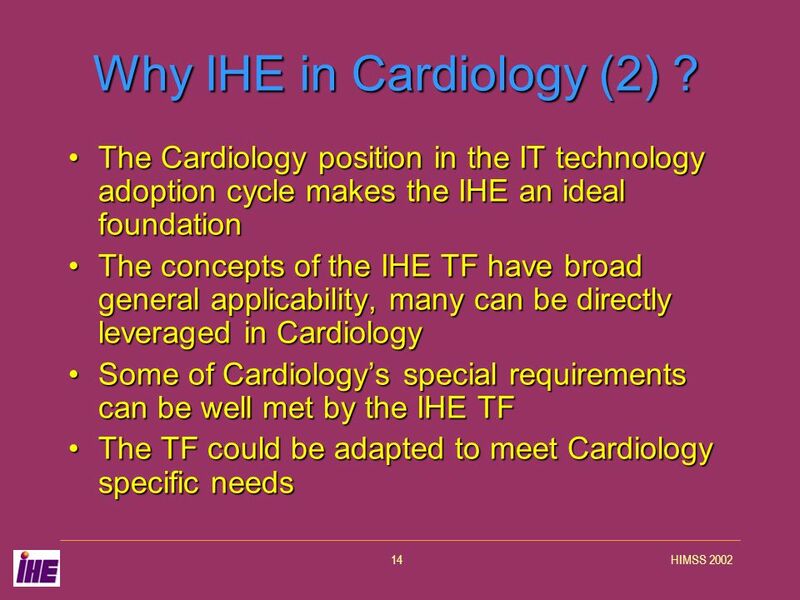 1 IHE Cardiology Profiles Harry Solomon Co-chair, IHE Cardiology Technical Committee. 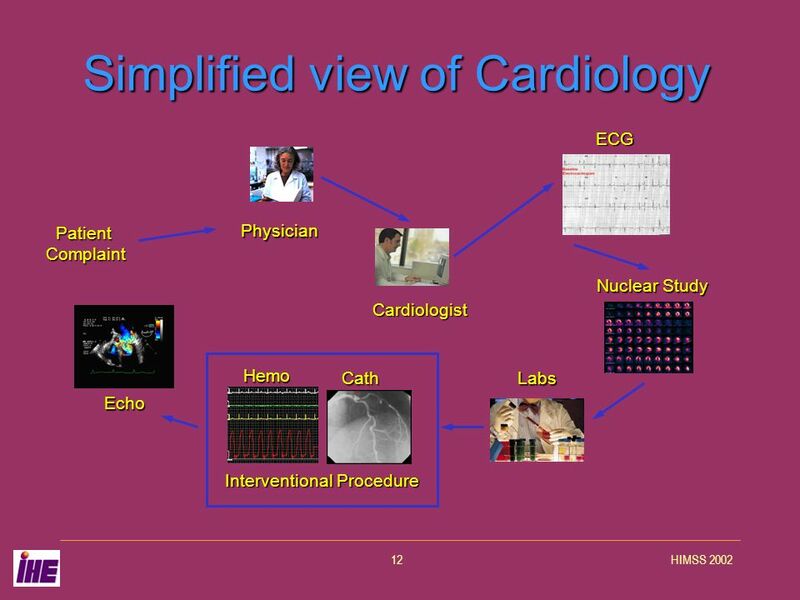 European Society of Cardiology IHE Cardiology Profiles Harry Solomon Co-chair, IHE Cardiology Technical Committee. 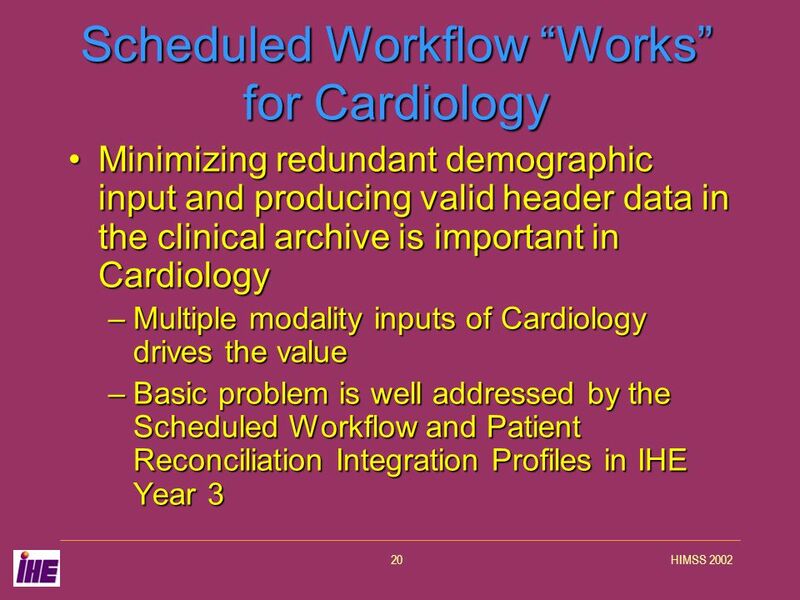 RSNA Implementation of IHE Integration Profiles at the Cleveland Clinic Foundation Dr. David Piraino, Section Head of Radiology Informatics. 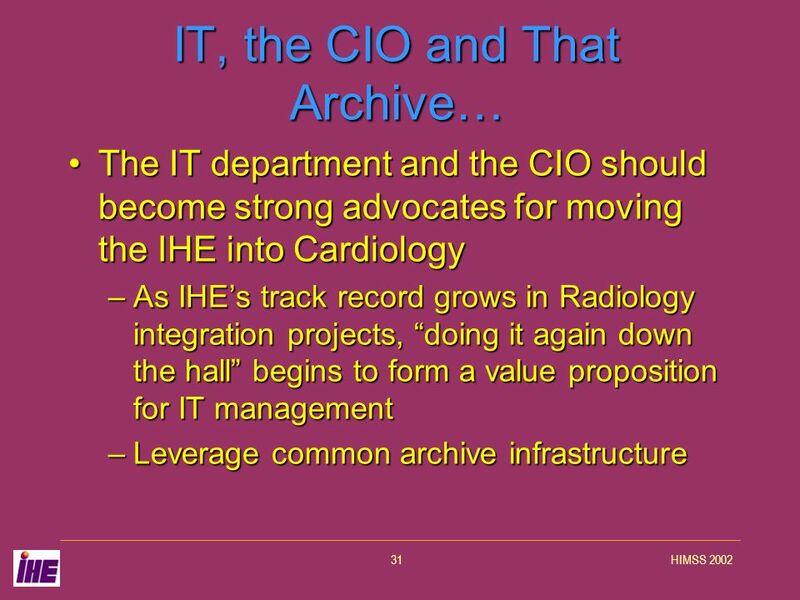 DICOM and Integrating the Healthcare Enterprise: Five years of cooperation and mutual influence Charles Parisot Chair, NEMA Committee for advancement of. 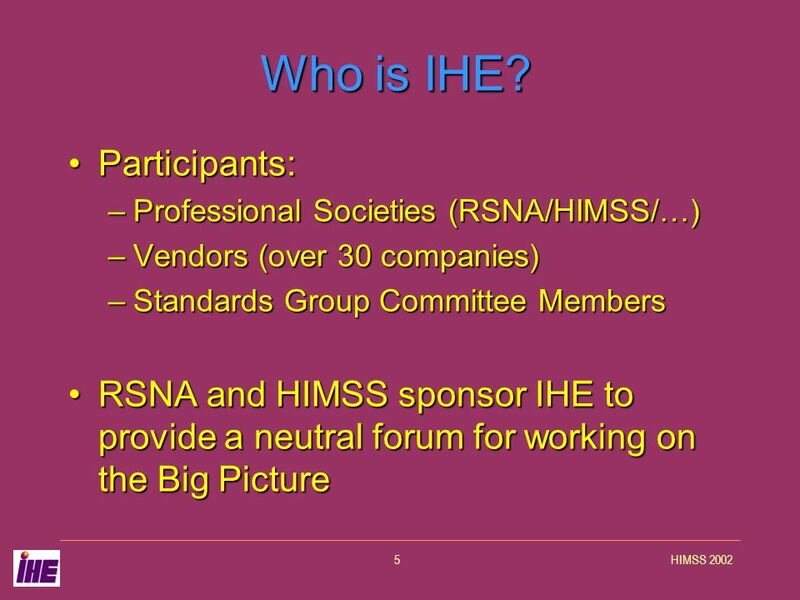 February 9, 2005IHE Europe Participants' Workshop 1 Integrating the Healthcare Enterprise Nuclear Medicine Image - NM Dr. Jerry Wallis (SNM) IHE Radiology.